Anyone working with digital documents on a regular basis knows how important the PDF format can be in everyday situations. Whether you are a student or professional, PDFs are, more than likely, a big part of your life. PDFs are popular because they present a compact and universal way to send and receive digital information. The format can hold a lot of information in a small file size and the document looks identical no matter what platform it is being viewed on. But no file format is perfect, and such is the case with the PDF as well. One of its main limitations is the fact that PDFs are not easily editable. This can be very frustrating, especially for users dealing with data and statistics that need to be altered and processed in some way or another. Such information is best edited via Microsoft Office’s spreadsheet program, Excel, which is easily editable and very convenient for presenting tabular data and statistics. To the relief of many PDF users, there are many online tools available for converting PDFs into Excel. One of the leaders in this industry is Investintech, a company that offers professional desktop solutions for quick, reliable and accurate PDF conversion. The company has recently taken its lauded desktop technology to the mobile market, with the release of the free mobile PDF conversion app. The app is a lightweight, mobile version of Investintech’s flagship Able2Extract software, and offering users free, fast, high quality PDF conversions into a variety of popular formats, such as MS Excel, Word, PowerPoint and more. The app is available for both Android and iOS users and is incredibly easy to use. Simply locate the PDF File you want to convert - whether from an email, a cloud storage app or any other location - long-press the file and send it to the Able2Extract mobile app. Click the “Convert” button - easily located on the apps user-friendly interface - choose the conversion type you desire, and let the app do the rest. Your file is immediately sent for conversion via Investintech’s powerful online server. Once the conversion is completed, it will be located in the app’s file list, from which you will be able to use it as you wish. Users can share the converted file via the mobile app, open it with another application, and easily delete it from the file list once it is no longer needed. The fact that the conversions take place on Investintech’s servers makes the app extremely lightweight. Therefore, conversion will not slow down your Mobile device, exhaust its resources, or drain its battery power. The app also offers complete security for your files – no personal information is needed for conversion and your original and converted files are deleted from the server 24 hours after the conversion has been completely. 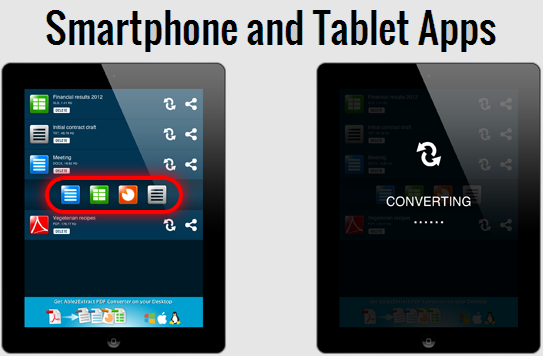 Anyone looking for a compact fast and completely free mobile app for performing highly accurate and secure PDF conversions to Excel and other file formats should give Able2Extract mobile a look. It provides a very easy and convenient way for users to convert and manage their documents on the go and from the palms of their hands.